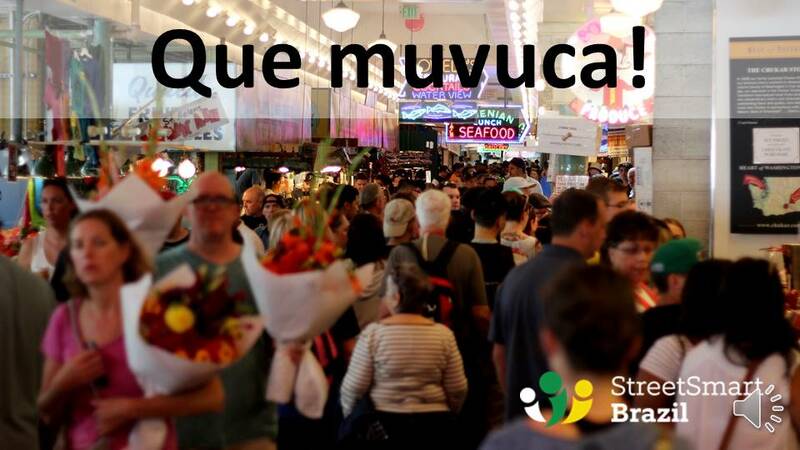 You will learn a fun Brazilian slang word today: Muvuca. The goal of my one-word Portuguese lessons is to make your Portuguese sound more natural and fun by using slang words, colloquial Portuguese, and idiomatic expressions. You will not find regular words in these Portuguese lessons. Here you will learn slang words, colloquial vocabulary, and expressions that you don’t find in textbooks. You walk into a mall the day before Mother’s Day. The mall is super crowded. You can say: Que muvuva! = How crowded! You walk into a bar and it’s crowded and loud. You can say: Esse bar tá uma muvuca. = This bar is crowded and loud. We teach Brazilian Portuguese via Skype. Enjoy your own private, online Portuguese tutor. Book a Trial Lesson today.